Welcome back to our alcohol-fueled lesson on America’s wondrous and extensive cocktail history. If vodka isn’t your drink (even in the form of a Cape Codder), we think this might be exactly your speed. This week we go back to our forever faithful — not to mention favorite — tequila. There’s no doubt you’ve ordered a Tequila Sunrise more times than you can remember. This cocktail is one of the ultimate vacation drinks — whether you’re actually on vacation or not. It’s paradise in a tall glass. Sweet, tart and most importantly … 50% tequila. Given its tropical feel, you may have believed the Tequila Sunrise originated in the Caribbean, but Arizona’s history tells otherwise. 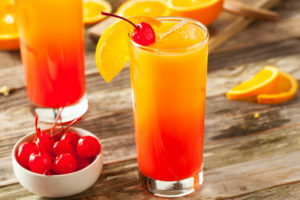 In the 1930s, bartender Gene Sulit invented the original Tequila Sunrise at the Arizona Biltmore Hotel, though his original recipe was quite different than the drink we know today. It contained tequila, creme de cassis, lime juice and soda water. The name was inspired by the classic Arizona sunrise: a dark to light fading pink. Much later, in the 1970s, a few young bartenders amended the recipe to give it a sweeter edge in the form of (drumroll …) grenadine and OJ. Both the original and the updated version are equally delicious, so we’re sharing both recipes. Who knows? You may even find you like the old school version better. The only way to find out is to give ’em both a try! Fill a tall glass with ice. Add the tequila, crème de cassis and a squeeze of fresh lime juice. Fill with club soda. Garnish with a lime wedge. Stir or shake together tequila and orange juice. Fill glass with ice cubes; pour in orange juice mixture. Slowly pour in the grenadine, and allow it to settle to the bottom of the glass. Garnish with a slice of orange and a maraschino cherry.